Confirm your PoE network attributes with the PoE detector and monitor. 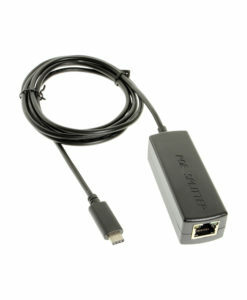 It is compliant with IEEE 802.3 at, af, bt type3. Loaded with necessary PoE essential monitoring tools, the PoE Detector is a great choice for testing, montoring, and troubleshooting PoE. Use For selecting specific PoE data to display. Compliant with IEEE 802.3 af, at and bt type3 standard PoE. Determines if switch or outlet has PoE capability and display power at PD connection. This PoE detector is a testing tool that is designed for speed testing and verification of standard active and passive PoE networks. It will also measure the power level of a PoE system with reversed polarity on IEEE 802.3 af (PoE), 802.3 at (PoE+) and 802.3 bt (PoE++) type3 and type4 compliant standard PoE. The PoE detector has a built-in Gigabit Ethernet transformer for PoE+ application. It has up to 1 Amps tolerance continuous for each mode total 2 Amps to isolate data passes and measure power without interruption of data. The PoE detector and monitor can accurately and continuously measure and display the power level of PoE at In-line testing. Easy setup for PoE system and troubleshoot connection issues. Detects and displays standard active and passive PoE includes type, sources, polarity, and power. PSE testing displays PoE type (af/at), power source (End/Mid), polarity and voltage, without need for a load. In-line testing measures and displays in rotation between voltage (Volts) and current (mA) and power (Watts). Determines the value of power to ensure that a powered device actually consumes. PoE network system confirmation for just all the power you do need. Step Button For selecting specific data to display. Default display for voltage value. Display 4 LEDs indicate IEEE 802.3 af or 802.3 at/bt standard. Dual 7-digit LEDs indicate power source either End (A) span (1/2, 3/6) or Mid (B) span (4/5, 7/8) or both. Display in rotation between voltage (U) (Vots), current (A) (mAs) and power (P) (Watts). Gigabit (PoE+) Ethernet Transformer Supports 10/100 and Gigabit data rates, isolated data passes through for all 4 pairs, with 1 Amp tolerance continuous for each mode. Standard Compliant IEEE 802.3 af (PoE), 802.3 at (PoE+), and 802.3bt (PoE++) type3 standard. Tester built-in PoE controller Load loss 0.75 Watt. If with 3K x2 resistance for triggering bt on, loss will be 2 Watts. Operating Humidity MAX 90% non-condensing.